The most universally recognized symbol of Jerusalem is not a Jewish or Christian holy place but a Muslim one: the Dome of the Rock. When people see its golden dome rising above the open expanse of al-Masjid al-Aqsa, they think of only one place in the world. O my little son, thou has no understanding. Verily al-Walid was right, and he was prompted to a worthy work. For he beheld Syria to be a country that had long been occupied by the Christians, and he noted there are beautiful churches still belonging to them , so enchantingly fair, and so renowned for their spendour, as are the Church of the Holy Sepulchre, and the Churches of Lydda and Edessa. So he sought to build for the Muslims a mosque that should be unique and a wonder to the world. And in like manner is it not evident that `Abd al-Malik, seeing the greatness of the martyrium [Qubbah] of the Holy Sepulchre and its magnificence was moved lest it should dazzle the minds of Muslims and hence erected above the Rock the Dome which is now seen there. The Dome of the Rock is Jerusalem's answer to Paris' Eiffel Tower, Rome's St. Peter's Square, London's Big Ben and Kuala Lumpur's Petronas towers; dazzling the minds of Muslims and non-Muslims alike. 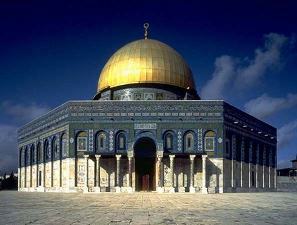 The Dome of the Rock is Jerusalem. The Dome of the Rock in Jerusalem, situated on the holy city, undoubtedly one of the most celebrated and most remarkable monuments of early Islam, visited every year by thousands of pilgrims and tourists. 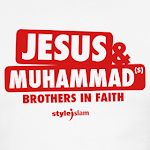 Unfortunately, it has also attracted the polemics from the non-Muslims and more so from the Christian missionaries. We aim to discuss some of them here. The Arabic Islamic Inscriptions On The Dome Of The Rock In Jerusalem, 72 AH. The inscriptions on the Dome of the Rock can be rightly called as the "big-daddy" of all the first century Islamic inscriptions. Built by Umayyad Caliph `Abd al-Malik, these inscriptions have copious amount of Qur'anic verses. The Copper Plaque Inscriptions At The Dome Of The Rock In Jerusalem, 72 AH. The Arabic inscriptions in copper plaques at the eastern entrance and the northern portal of the Dome of the Rock are not as well known as the ones inscribed inside the Dome of the Rock. Inscribed by the Umayyad Caliph `Abd al-Malik, these inscriptions have five Qur'anic verses quoted partially. Did `Abd al-Malik Build Dome Of The Rock To Divert The Hajj From Makkah? Al-Zuhri - The Man Behind The Hajj To Dome Of The Rock? The Qiblah Of Early Mosques: Jerusalem Or Makkah? Early Mosques In Negev: How Were They Oriented? Appendix: Who Turned The Temple Mount Into A Garbage Dump?